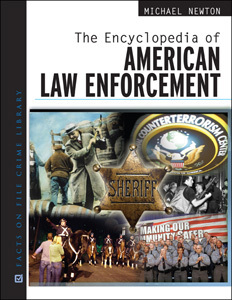 Written in a clear and engaging style, The Encyclopedia of American Law Enforcement provides an A-to-Z history of the police and law enforcement authorities in the United Statesfrom the 17th century to the present. More than 600 entries highlight the world of law enforcement and its role throughout history. Biographical information on figures such as U.S. attorney generals and FBI directors, various police chiefs and commissioners, sheriffs, criminologists, detectives, and victims is also provided. This fascinating volume is perfect for anyone interested in law enforcement and its development throughout history. Community outreach and crime prevention efforts, such as Crime Stoppers and D.A.R.E. "...another handsomely produced Facts On File encyclopedia...should be of interest to anyone seeking information on American law enforcement topics." "...attractively illustrated...clear, concise writing...will be used and read profitably by both the student and the casual reader..."